Bentonville, NC: 150th Anniversary Reenactment of the Battle of Bentonville. « The Turner Brigade--Missouri Volunteers, U.S.
« Pilot Knob, MO: Brigade Spring Drill. Bentonville, NC: 150th Anniversary Reenactment of the Battle of Bentonville. The Friends of Bentonville Battlefield hosted the 150th anniversary reenactment of the Battle of Bentonville at the Bentonville Battlefield State Historic Site in Four Oaks, North Carolina, March 21-22. This was a First Federal Division event. Co. E Sgt. 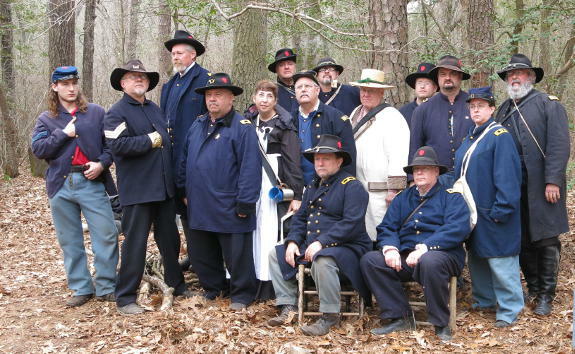 Scott House, second from left, poses with the First Federal Division command staff at the Battle of Bentonville reenactment in Bentonville, NC, March 21-22, 2015. Co. E Sgt. 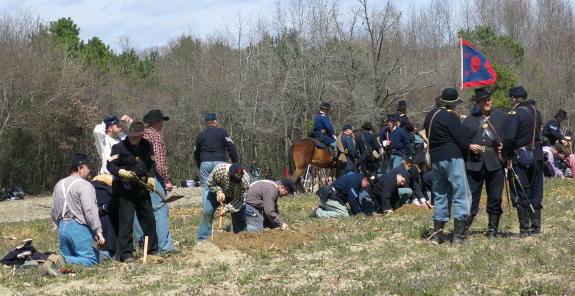 Scott House, in coat at left, directs the digging of entrenchments at the Battle of Bentonville reenactment in Bentonville, NC, on March 21-22, 2015. The Union line holds on the second day of the Battle of Bentonville reenactment in Bentonville, NC, on March 21-22, 2015.